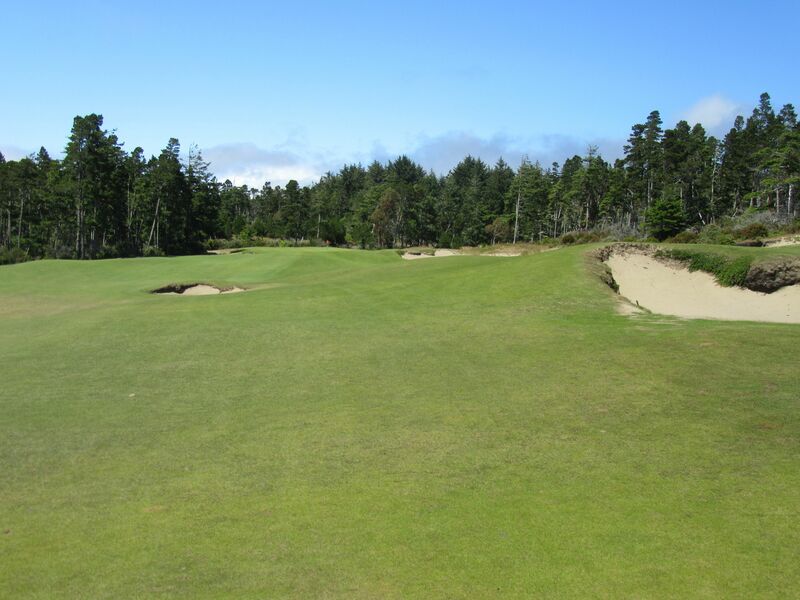 Bandon Trails, a consensus top 25 course in the country, is the perfect inland complement to the mecca of oceanfront golf courses at Bandon Dunes Golf Resort. 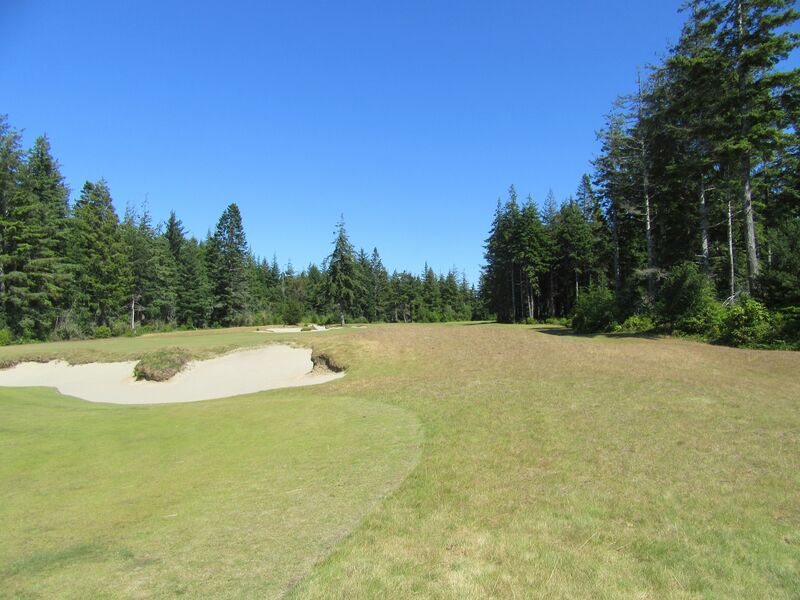 While it consistently is ranked slightly lower than the other three championship courses on the property (even though top 25 is certainly in an esteemed air! 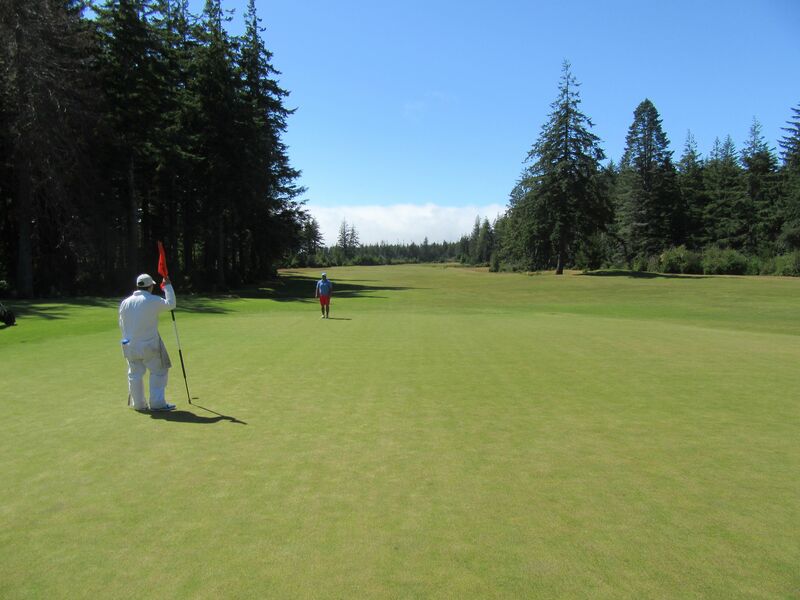 ), it tends to rank very highly on property when discussed with golf enthusiasts who visit the resort. “It’s like, ‘How many holes can you possibly walk along the Pacific Ocean? 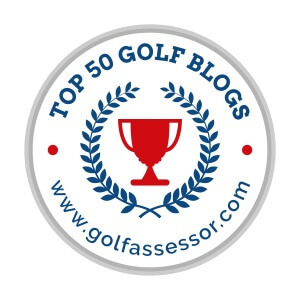 '” one golf writer told me. “It’s so nice to get out of the wind for a change,” another one said. 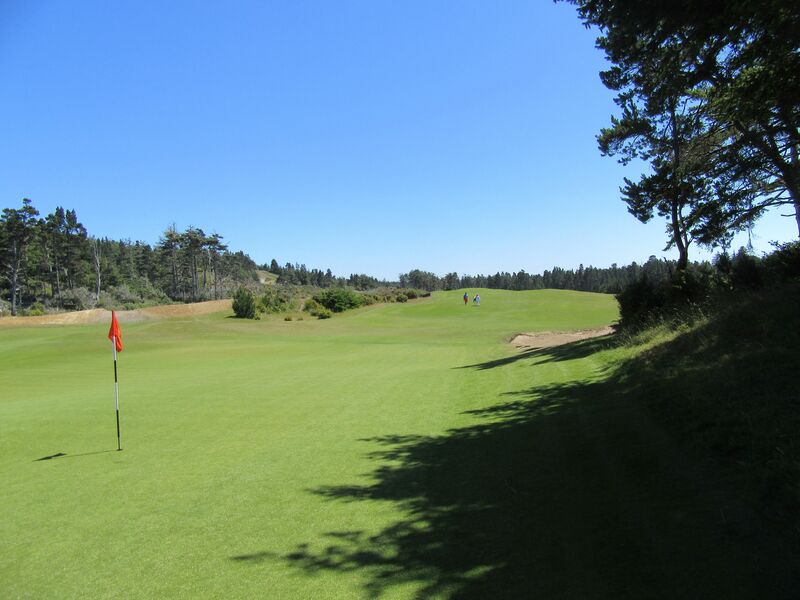 Certainly, as any staff member at Bandon Dunes will tell you, the ideal time to play the course at Bandon Trails is during the afternoon, when the winds are at their highest and the rich forests provide some shelter that is nowhere to be found on Pacific Dunes, Bandon Dunes or Old Macdonald. 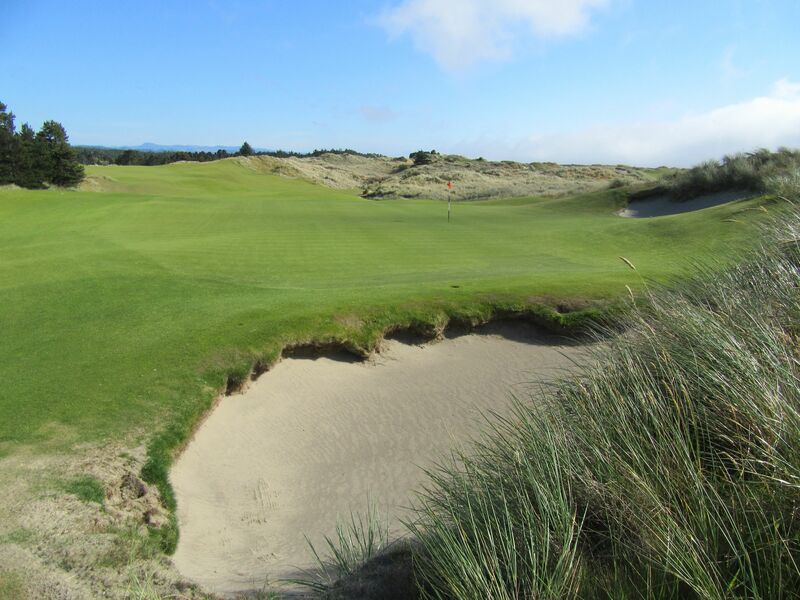 The world’s best golf course design team of Bill Coore and Ben Crenshaw knocked Bandon Trails out of the park. The canvas they were provided for this project featured massive rolling dunes, vast oceans of fescue-covered meadows and deep, dense forests. 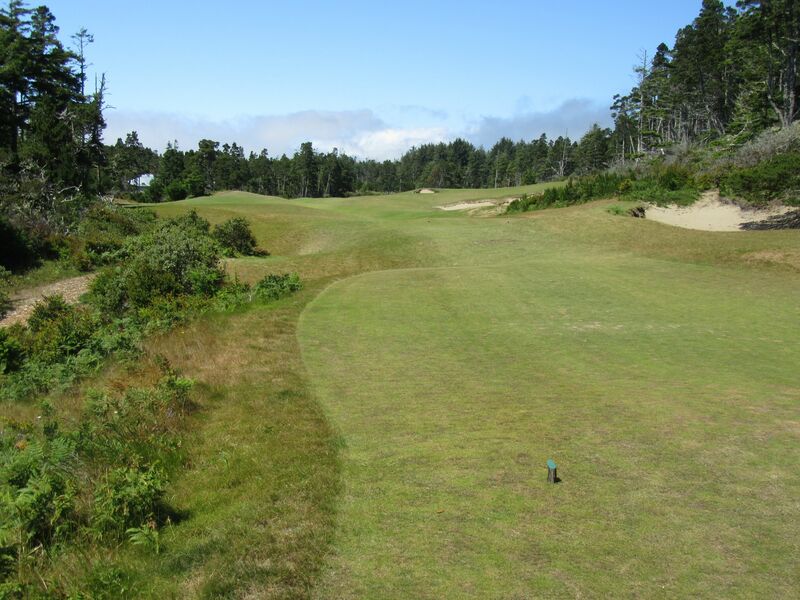 Coore/Crenshaw designed Bandon Trails with exceptional hole variety, too, and managed to create a playing experience that is equal parts Streamsong, Pinehurst No. 2 and Sand Hills golf. The result of their creativity and expertise is simply stunning. 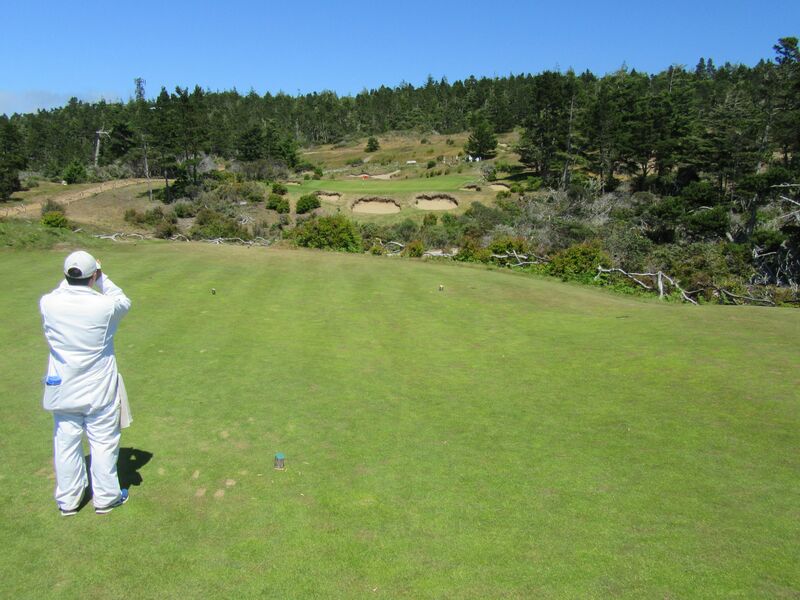 Bandon Trails leads off with an intimidating tee shot that is as exposed as any other hole on the course to the extreme winds that blow over the Bandon Dunes Golf Resort. 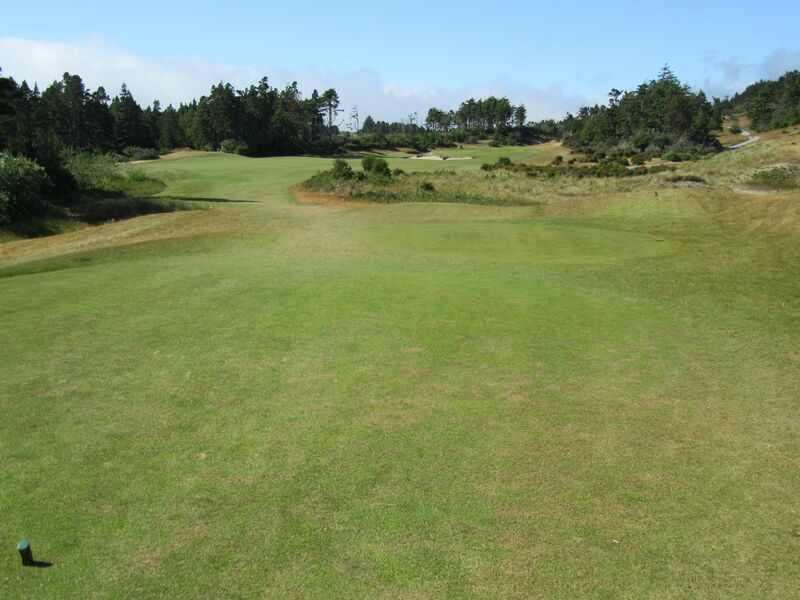 A slight leftward leaning par four with fescue everywhere, the first hole takes place on one of the highest points on the property, just outside the Bandon Trails clubhouse. 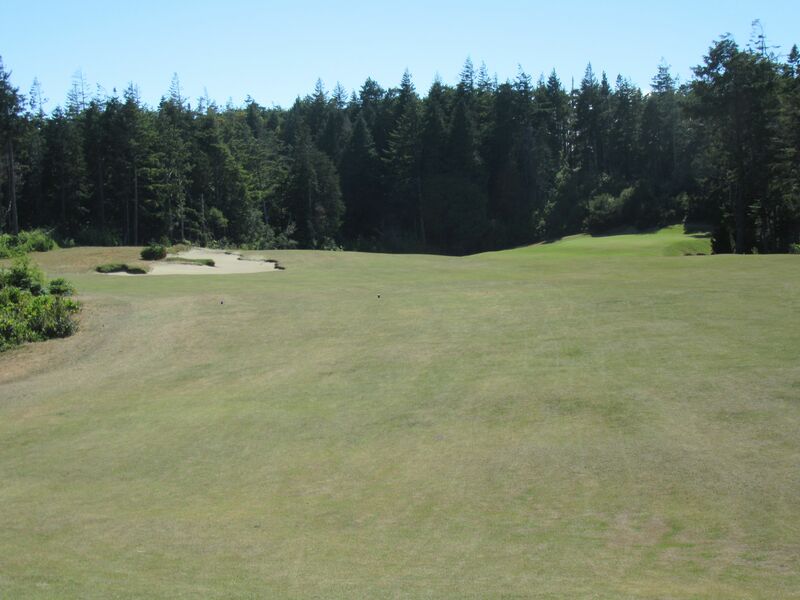 The second hole provides the first “Wow” moment at Bandon Trails, with a highly elevated tee box that plays to a slightly hidden green downhill. 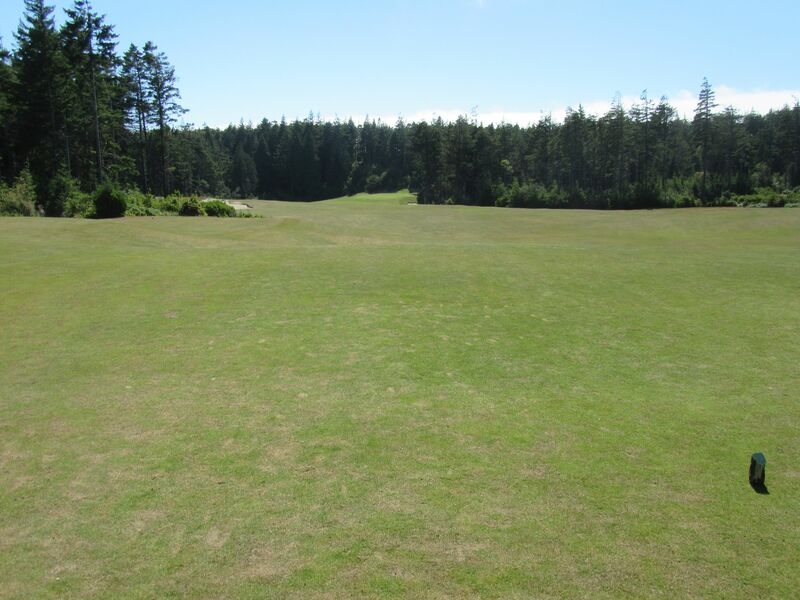 The left side of the green is invisible from the tees, and expands a bit farther than expected in that direction. 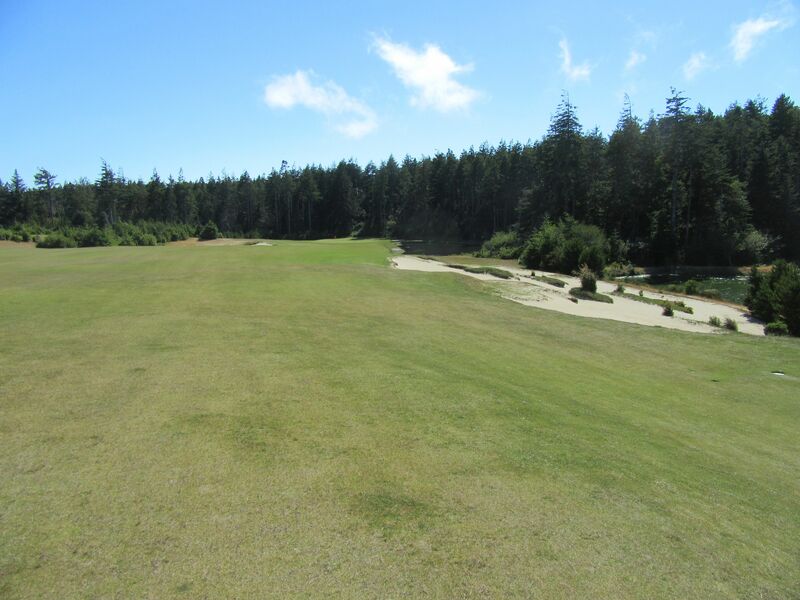 Bill Coore and Ben Crenshaw did a fantastic job building a world-class inland course at a facility that is best known for its coastal golf, and the third hole is a terrific example of their handiwork. Clearing the first traps is job one off the tee on three, and the best line is toward the right side of the fairway. 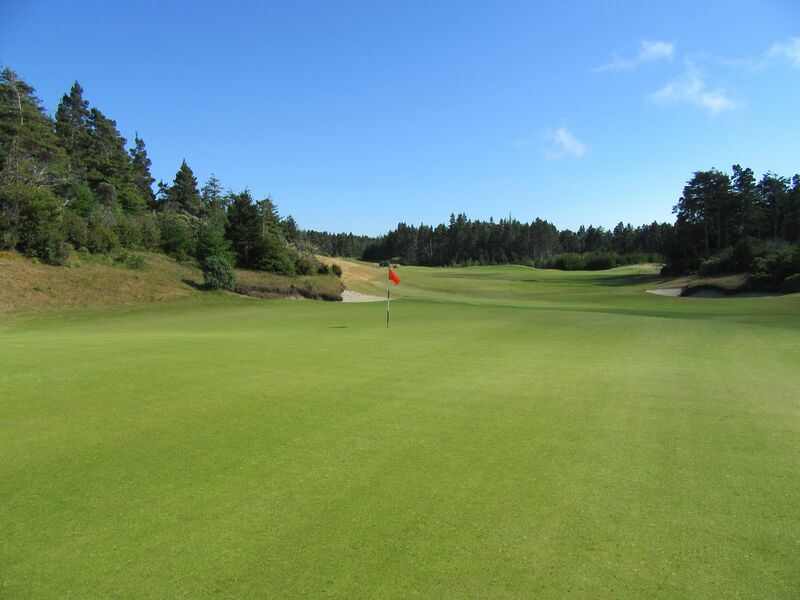 One of the shortest par threes on the entire property, save for the Bandon Preserve executive course, the fifth hole at Bandon Trails is a wonderful little par three with an expansive putting surface fronted by retaining green-side bunkers. These traps will keep shots from falling in to the canyon between the tee box and green, but will require a lofted sand shot to a green with dramatic contouring. 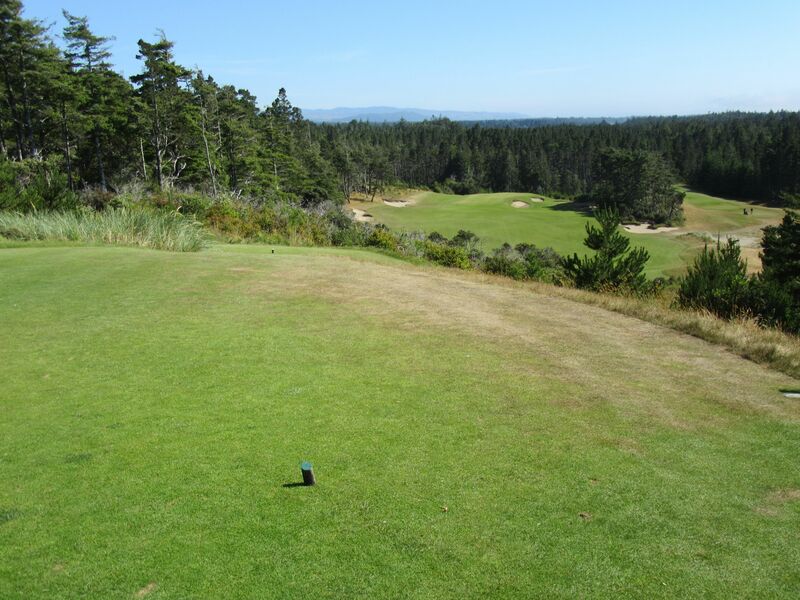 The wind at Bandon always forces golfers to consider club selection, even on a short par three like the fifth that plays to only 124 yards from the green tees. The driving area on six is one of the widest on the course, with tons of open space left of the small right-side fairway bunker. 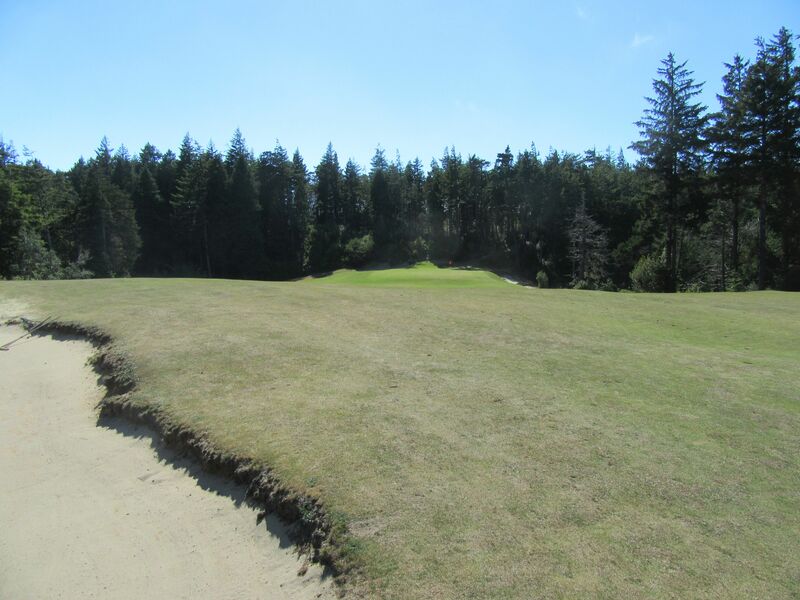 Carrying this trap would lead to a shorter and more visible approach, but the left side is alright although it brings in some tough bunkers en route to the putting surface. 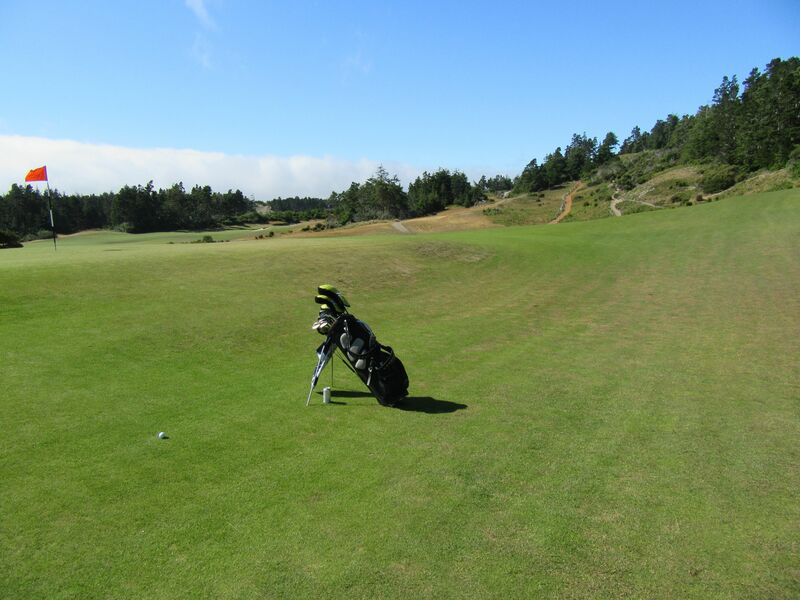 Hitting left of the right-side sand trap will likely lead to a drive that rolls aggressively forward and downhill. 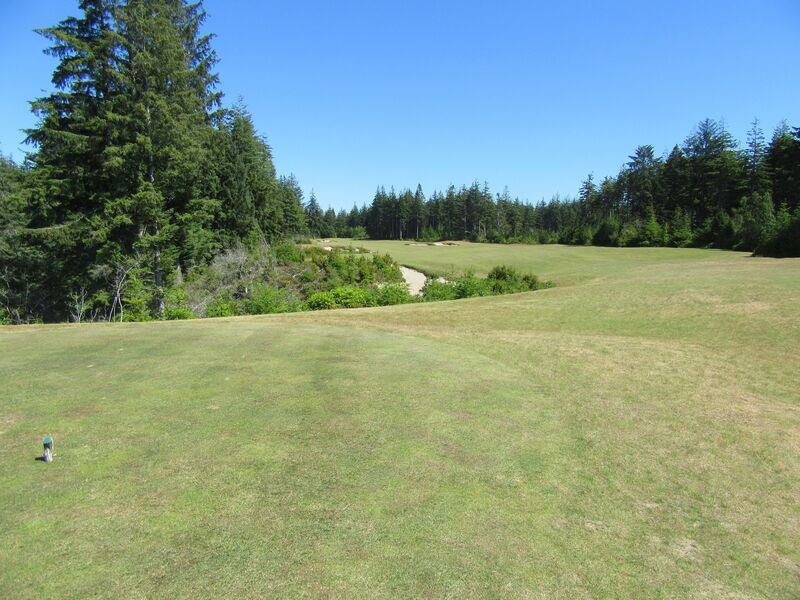 A long par four, the seventh has one of the widest fairways on the course but is bound to lead to a lengthy approach shot using either fairway woods or long irons. 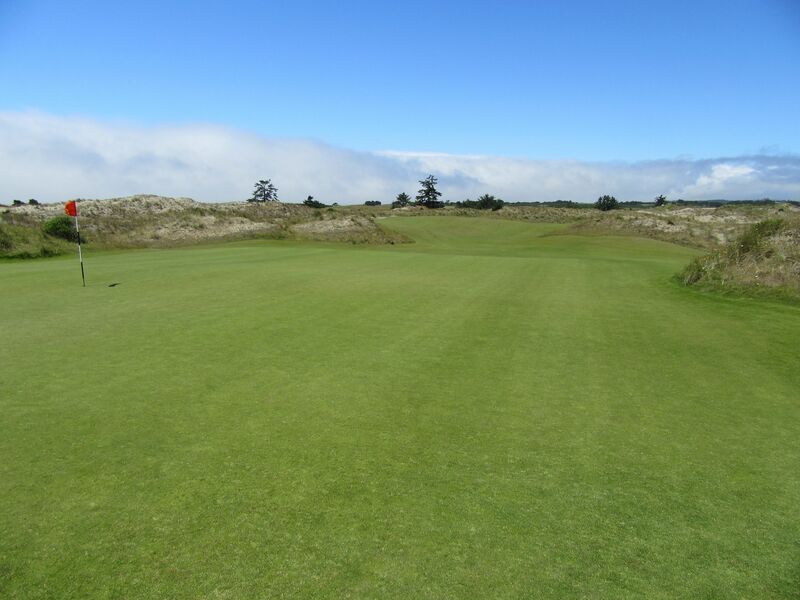 The first of two drivable par fours at Bandon Trails (the other being the fourteenth), the eighth plays to just 299 yards from the green tees. 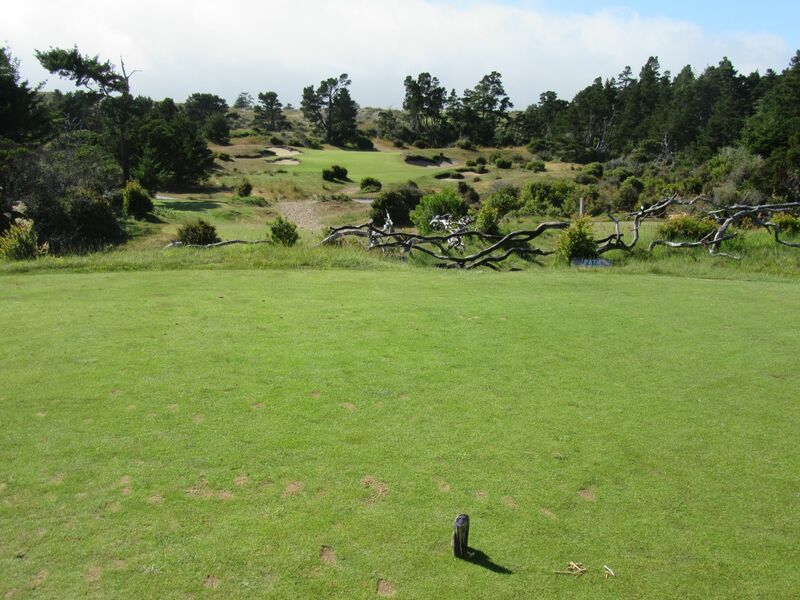 The tee shot, if hitting driver, is intimidating but plays to one of the widest areas on the entire hole. Laying up on eight is not simple – the target area for irons is narrow and falls off on both sides, and features several sand traps that can certainly come in to play. 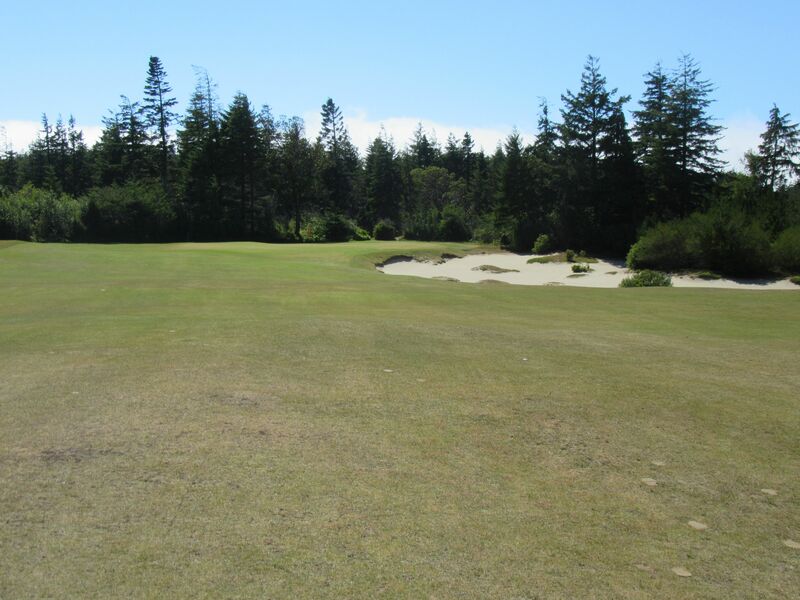 The green complex on eight is elevated and surrounded on all sides by sand, so while the hole is short it would be very difficult to run a first ball on to the putting surface. 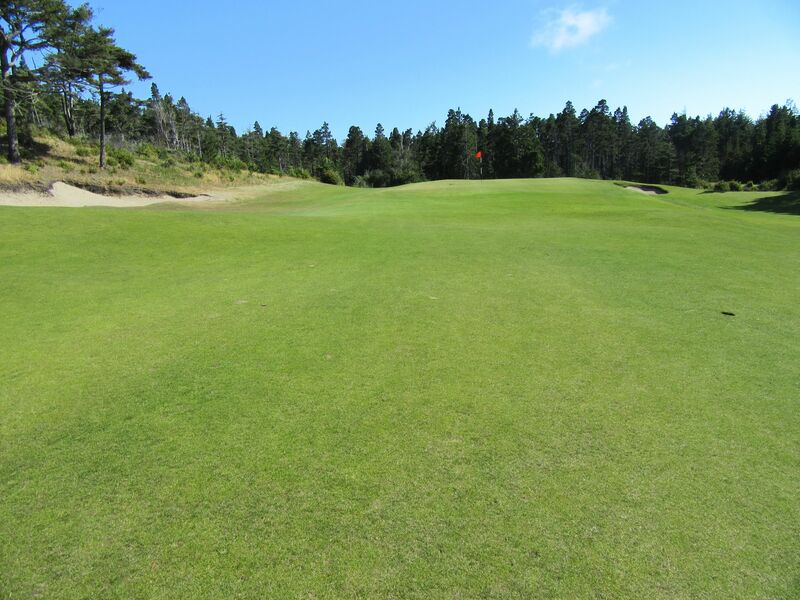 There is some room for error on eight when missing left, but will require a recovery shot to the green that is straight uphill and from patchy terrain. 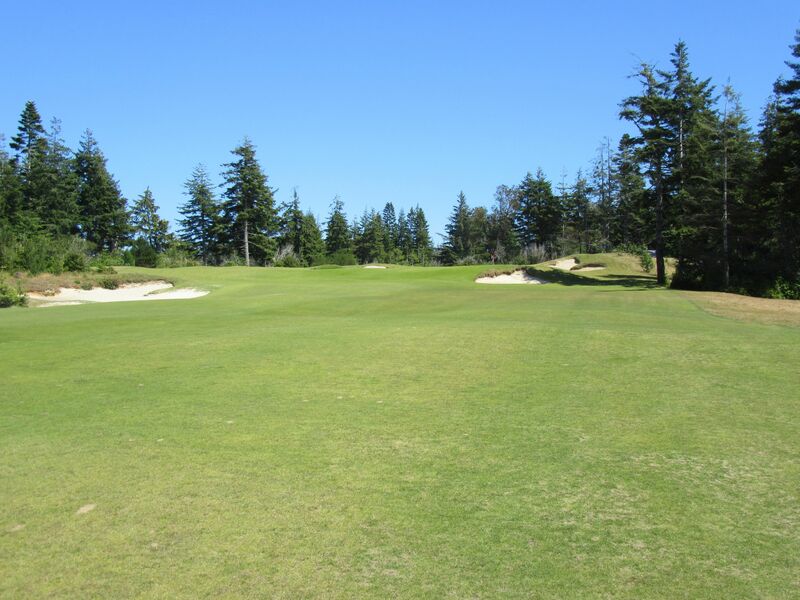 The ninth is a long par five with a wide and accessible fairway that runs from right to left off the tee. The second is the key shot here, as getting something in the fairway and far enough left to have a look at the green will be required. Somewhat similarly to the driving area on the ninth hole, the tenth hole tee boxes line up with a fairway that runs from right to left and long. 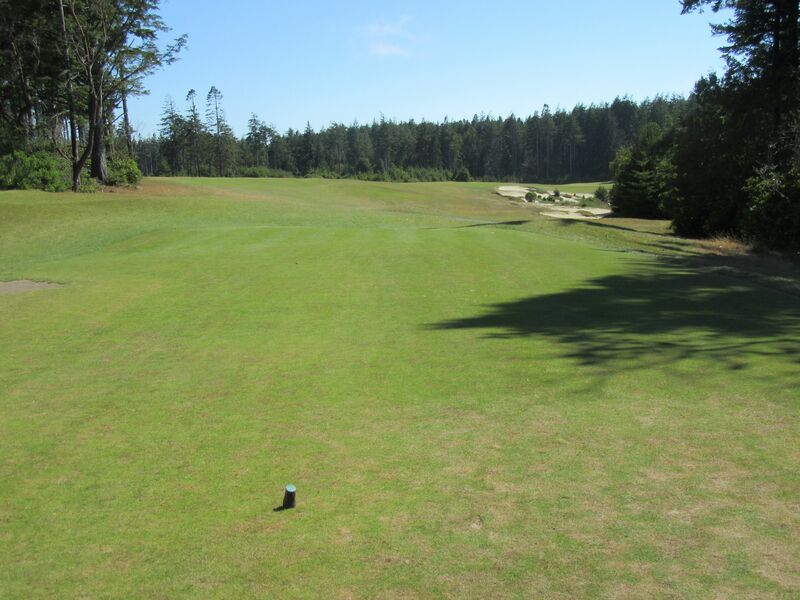 A drawn drive here is preferred, but there is more room right than it appears from the tee. The eleventh is quite possibly the most scenic hole on this entire scenic course. 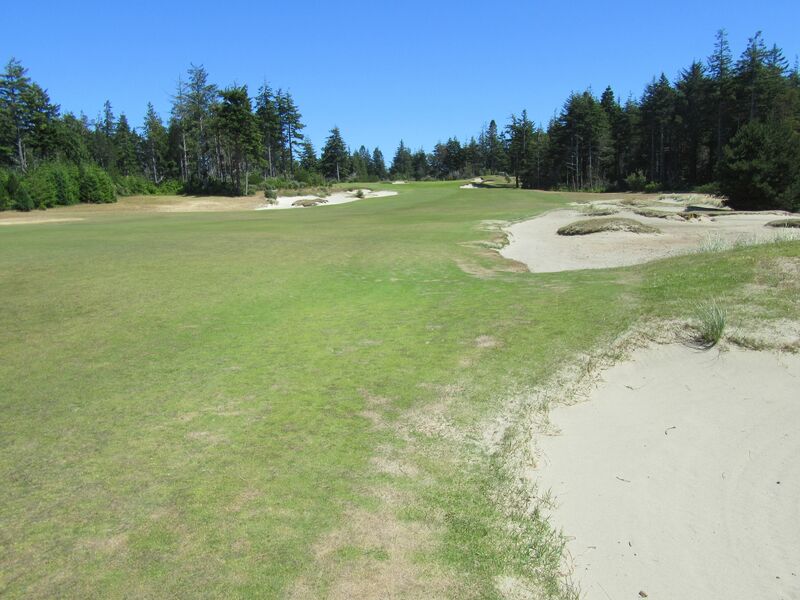 The sand traps on the right lead to a lot of trouble, and Daniel told us to stay far left of them. 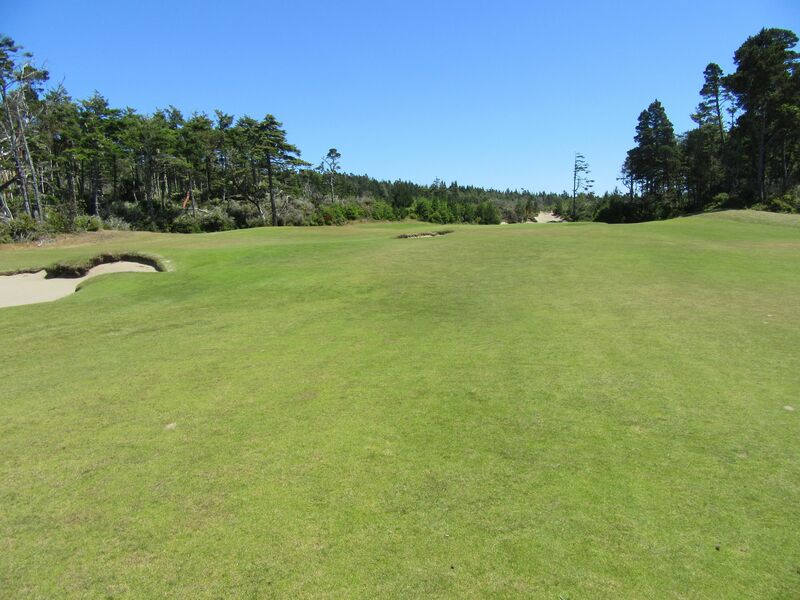 With the dogleg right in the fairway following them, though, it is tempting to try carrying the sand. 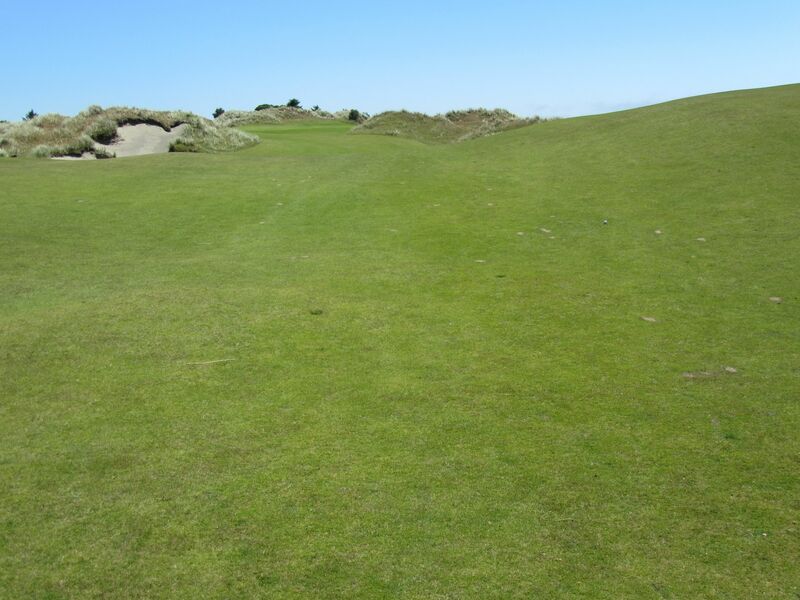 The fairway runs downhill and to the right hard, so even if those traps are carried then chances are the ball will end up in the water on the right. 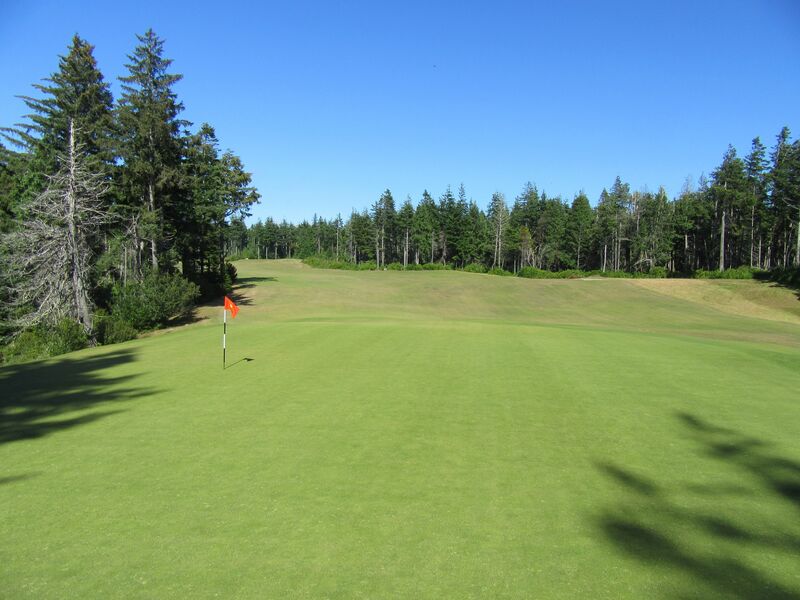 Aim at the tallest trees toward the left side of the treeline, and receive a tremendous roll-out downhill and towards the green. 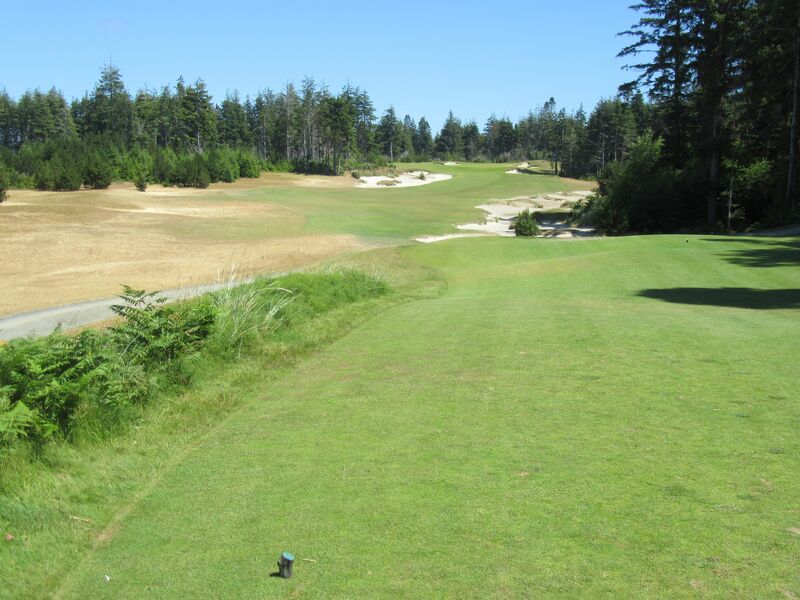 The twelfth is a brutally long par three. From 235 yards from the first tees in, it played even longer directly in to the wind. Greg and I both flushed three-woods, and his got to the front of the green while mine was just short and left. 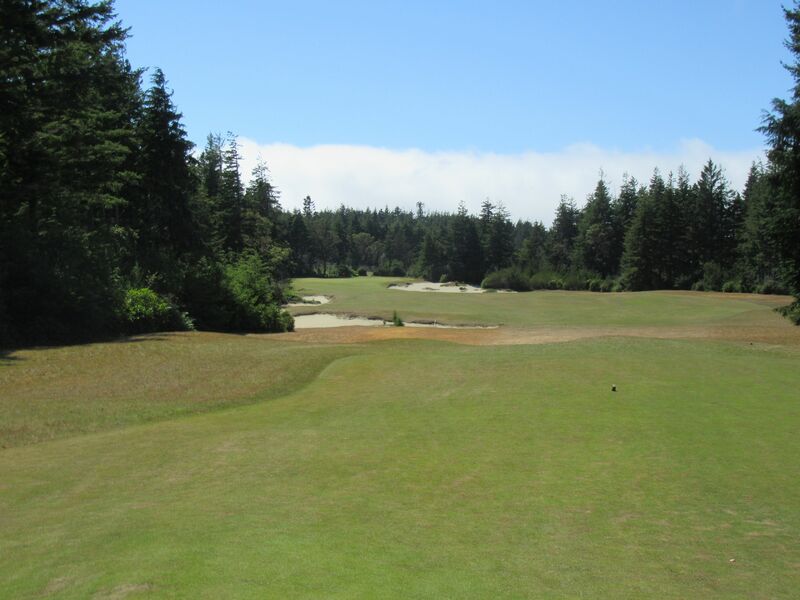 Thirteen is another beautiful, and challenging par four. 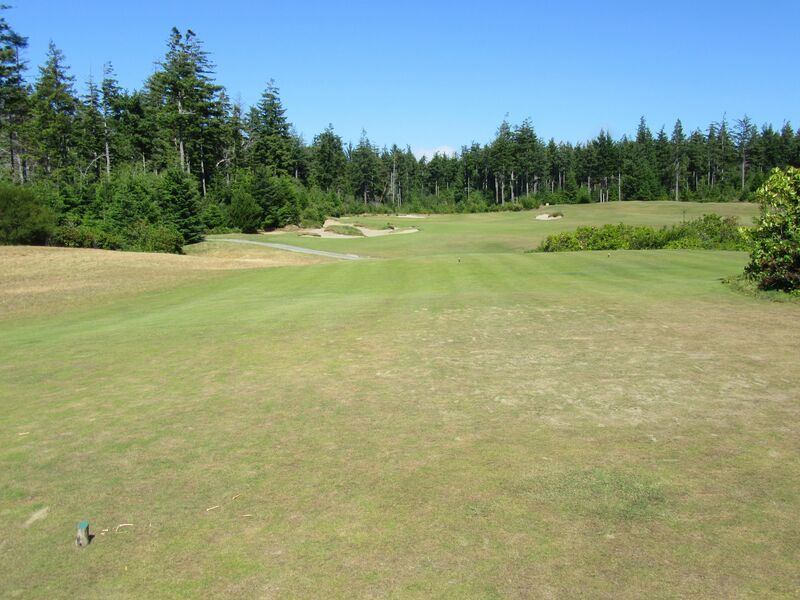 At 374 yards from the green tees, the path to the green is left of the encroaching treeline. 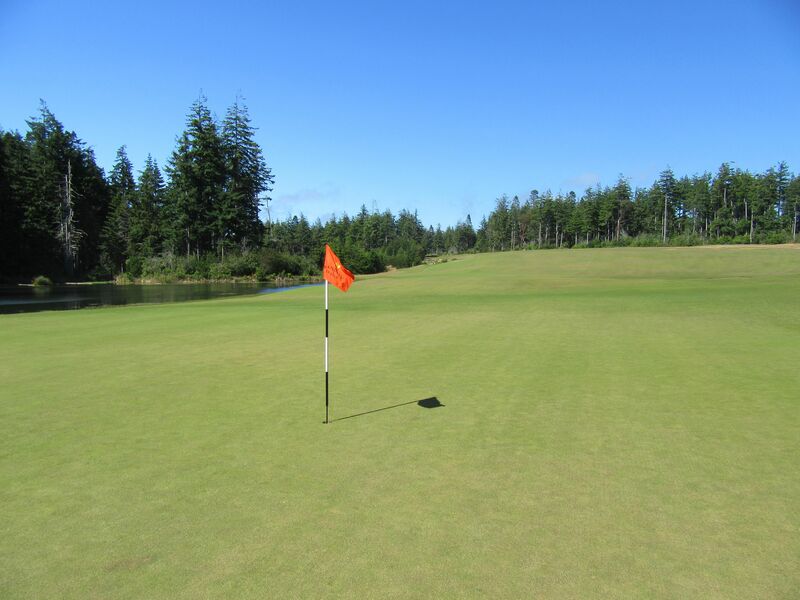 Avoid the traps left of the fairway en route to this elevated green with one of the most recessed sand features short-right of the putting surface. A shuttle picks up players after putting out on the thirteenth hole, and gives them reprieve from the uphill walk to the elevated (an understatement) tee boxes on fourteen. 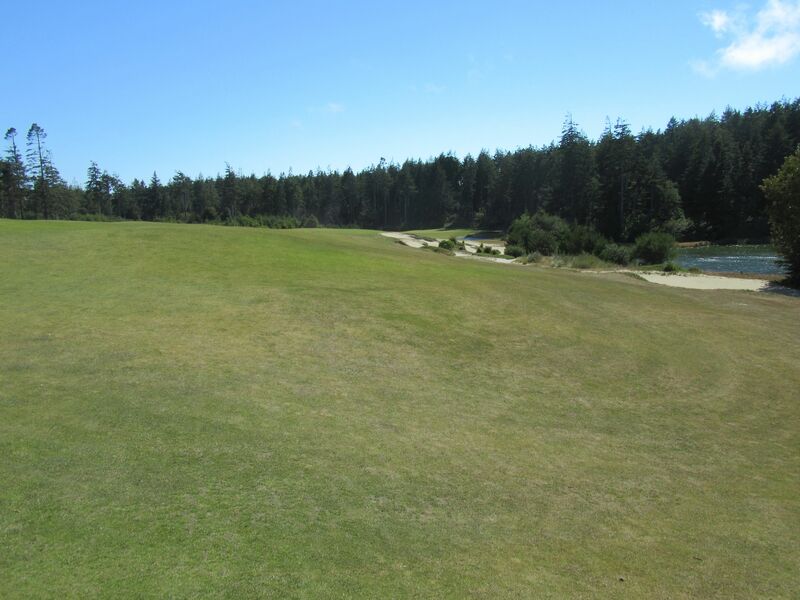 Stepping off the shuttle and walking out on to the tee boxes of fourteen reveals one of the greatest vistas on the entire Bandon Dunes Golf Resort property, and I am told the spot at which Mike Keiser knew he was building an inland course onsite. Fourteen is a polarizing golf hole. 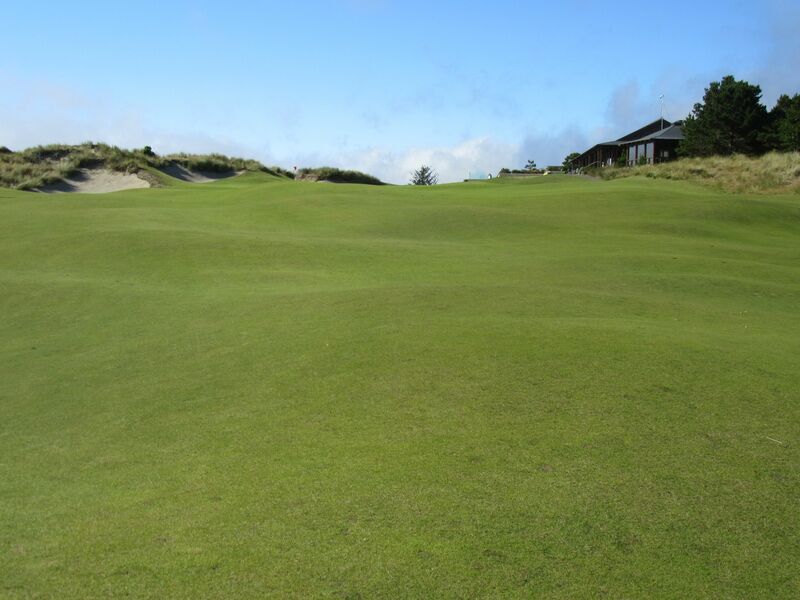 Some reviewers have been harsh on this hole, saying that the green complex is too difficult for the point of being difficult. It is domed and the false fronts on each side are cut short and run off to tough collection areas. Greg and I, each lacking any self discipline on the golf course, both hit driver and came away with two birdies. Mine was actually a bogey (or birdie with an asterisk as I hit my first drive to the fairway right of the fourteenth fairway and had no desire to go find it), but what fun is that? Greg’s drive was to the back-left collection area on the green, followed by a nice chip and six-foot putt for birdie (legitimately). 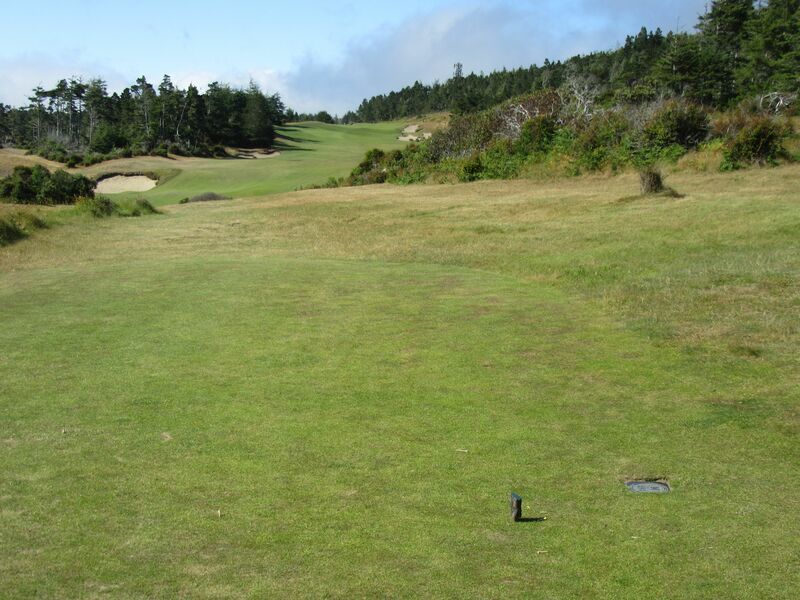 Mine was pin-high in the left-side collection area, then left on the lip for eagle and a little tap-in for bird. I’ll take it! 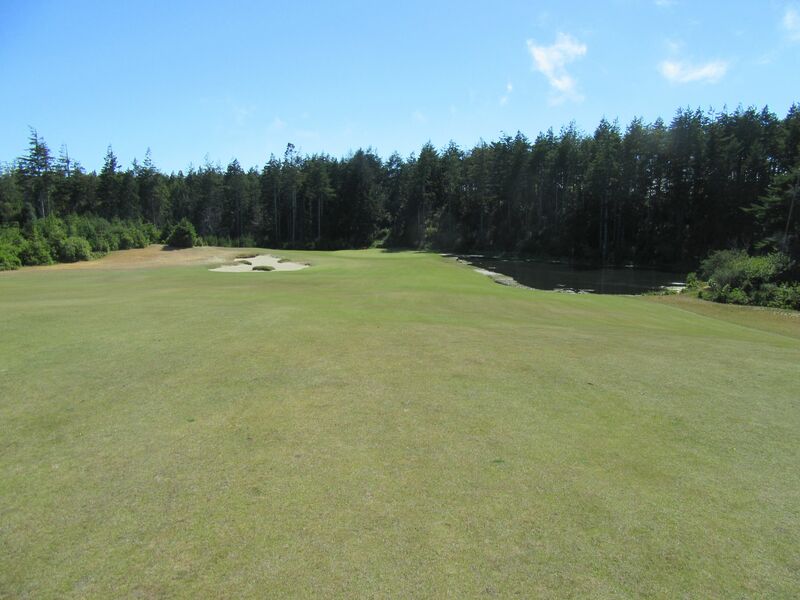 Fifteen is a tough par four for several reasons: The tee shot must avoid the laterally running cross bunker in the driving area, which if laid up in front of will leave a long approach shot to a green complex with a tough false front. Sixteen is one of the hardest golf holes I have ever played. 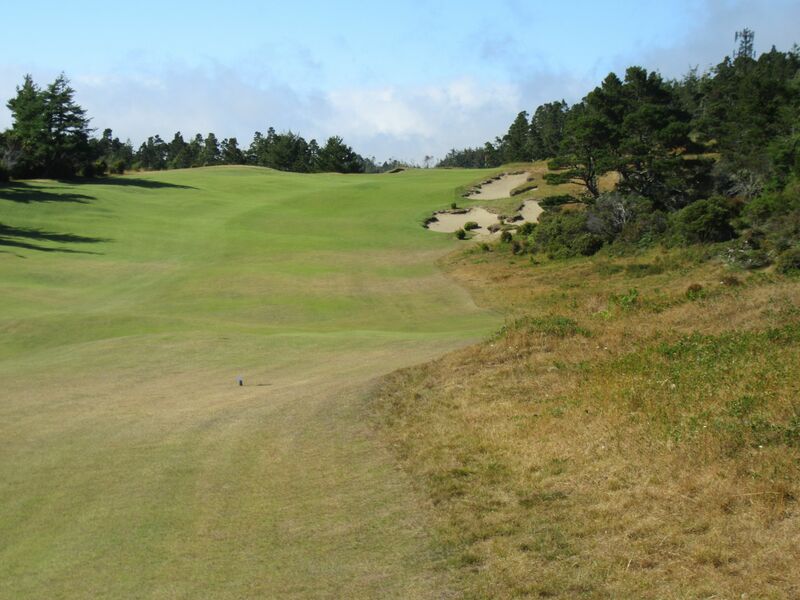 Into a strong Bandon wind off the Pacific Ocean, this par five plays directly uphill with a tight fairway and perched green. 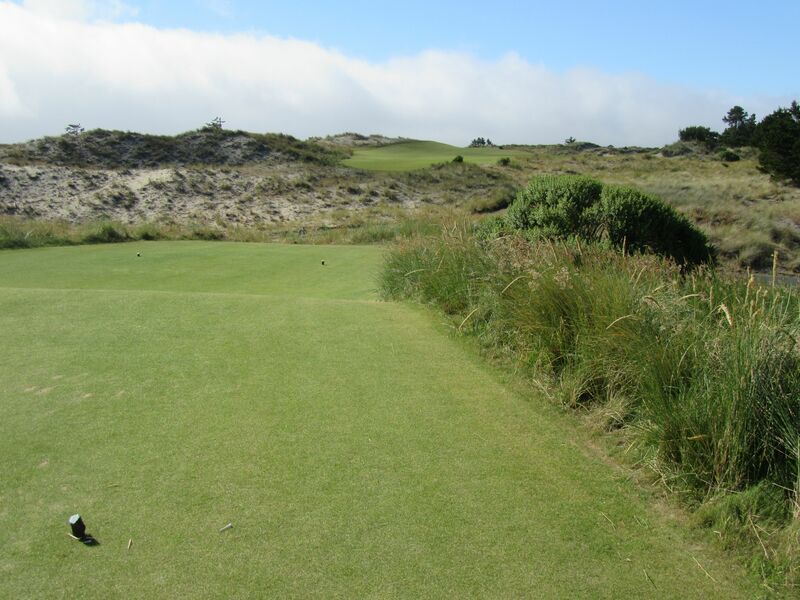 Littered with sand traps, the par three seventeenth is a strong one-shotter that is exposed to the wind. 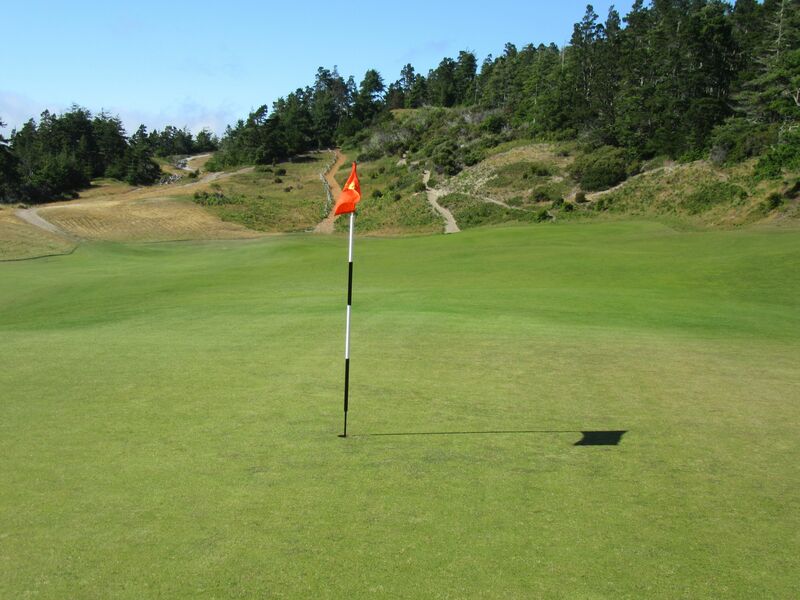 With a left-side pin location, flying the sand short-left of the green is absolutely essential for any chance at par. Slightly downhill, a precise shot and distance control are key here. 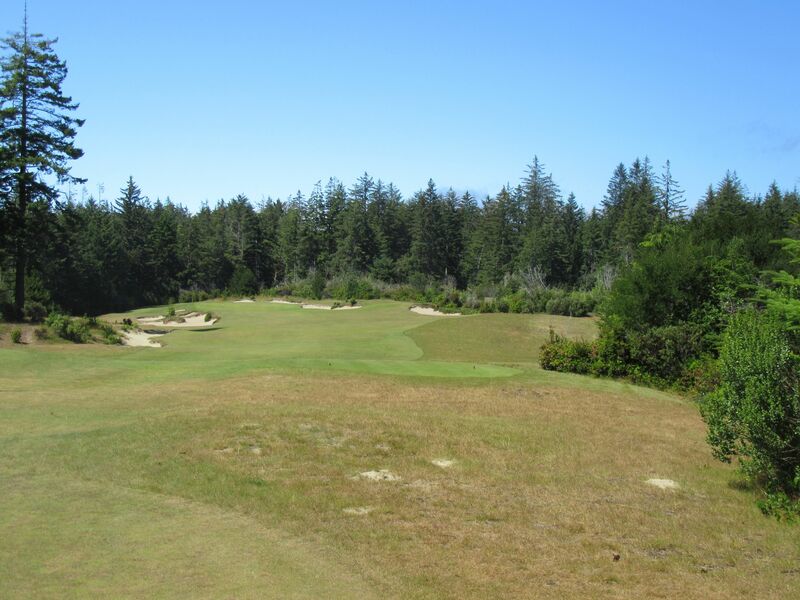 The eighteenth at Bandon Trails is a fantastic finishing hole, playing uphill to a mostly blind fairway leading to the clubhouse. 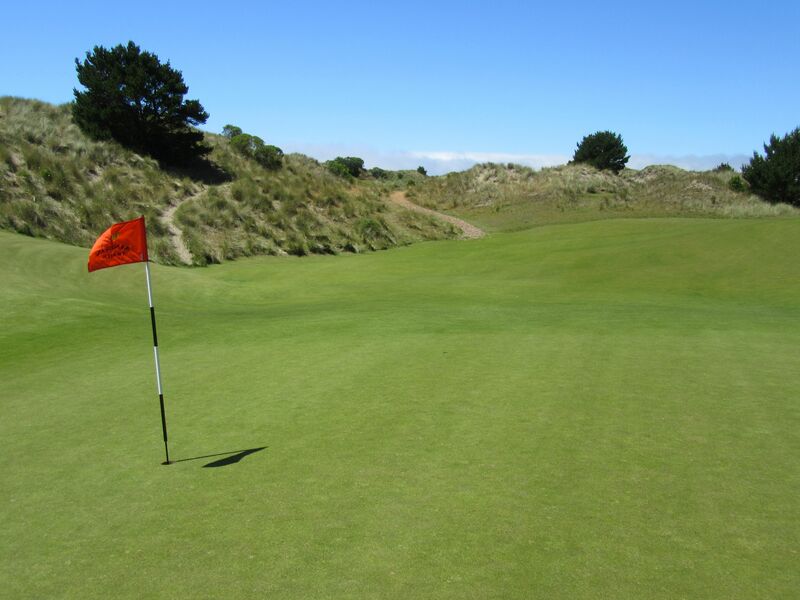 Stay right of the left-side sand dunes, as finding anything hit left is a chore (trust me!). 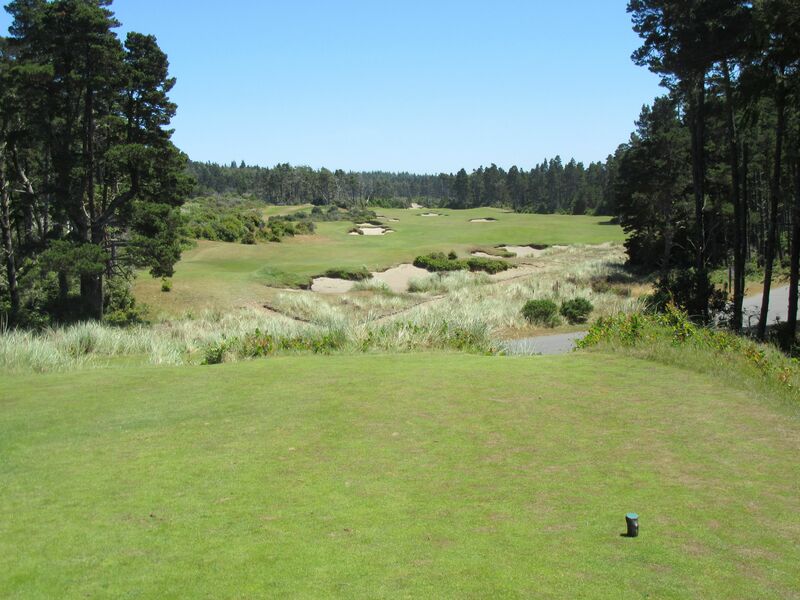 Bandon Trails completes the triad of course types at Bandon Dunes Golf Resort, being an absolutely world-class inland course that feels extraordinarily different from anything else on the property. 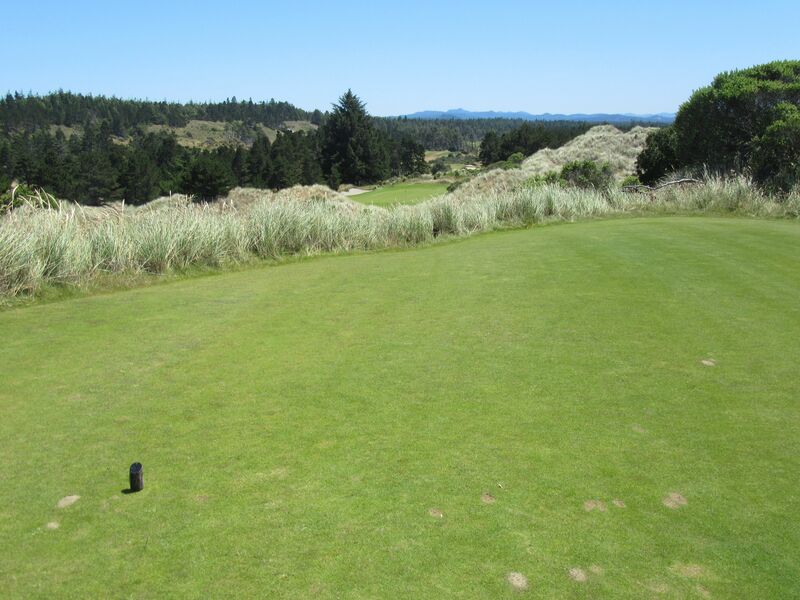 Bandon Trails looks and feels like Nebraska or Wyoming, with intense elevation changes, vast meadows and canyons, and rich forested terrain. 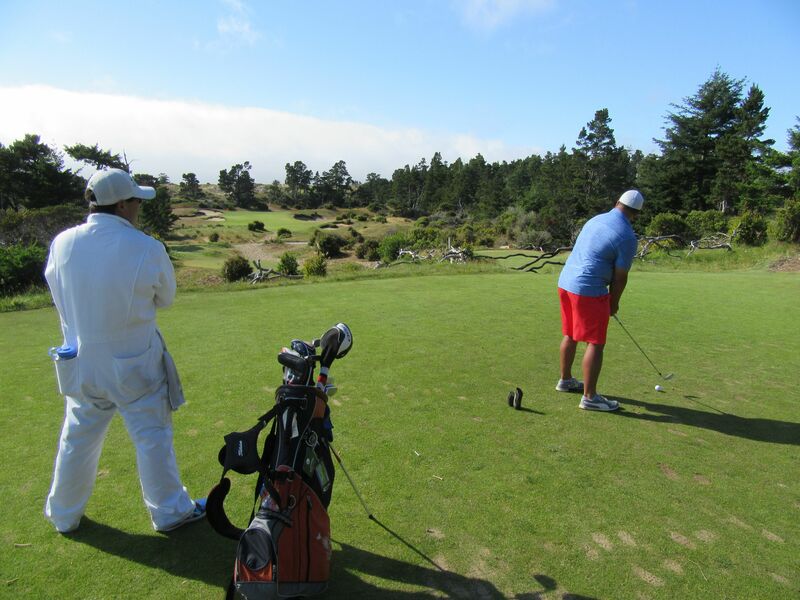 Dramatic vistas of mountain ranges and the Pacific Ocean on the horizon are mesmerizing, and for many golfers it will be their favorite course on the property because of how well Coore and Crenshaw executed their masterful design here. 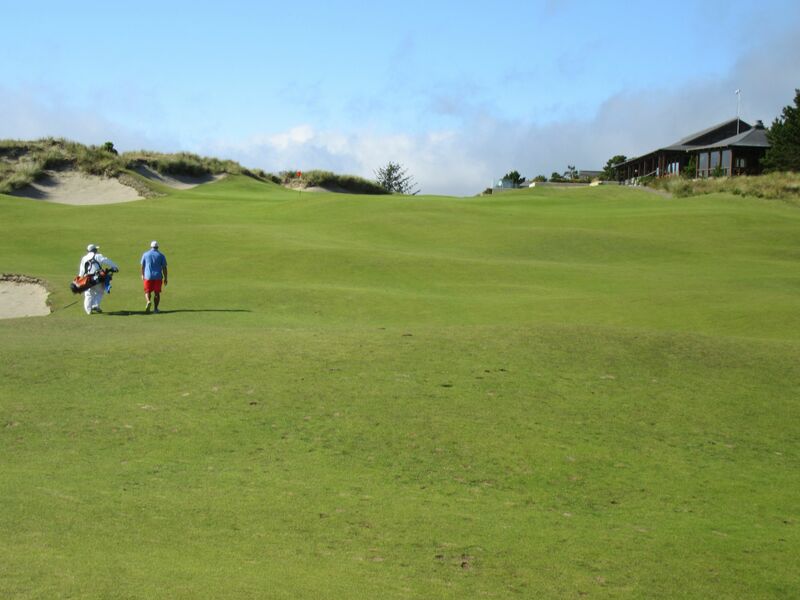 During your next trip to Bandon Dunes, make sure to play all four courses: The resort plays host to some of the very best coastal, links and parkland courses in the entire country and world, and Bandon Trails completes that trifecta to a magnificent extent. 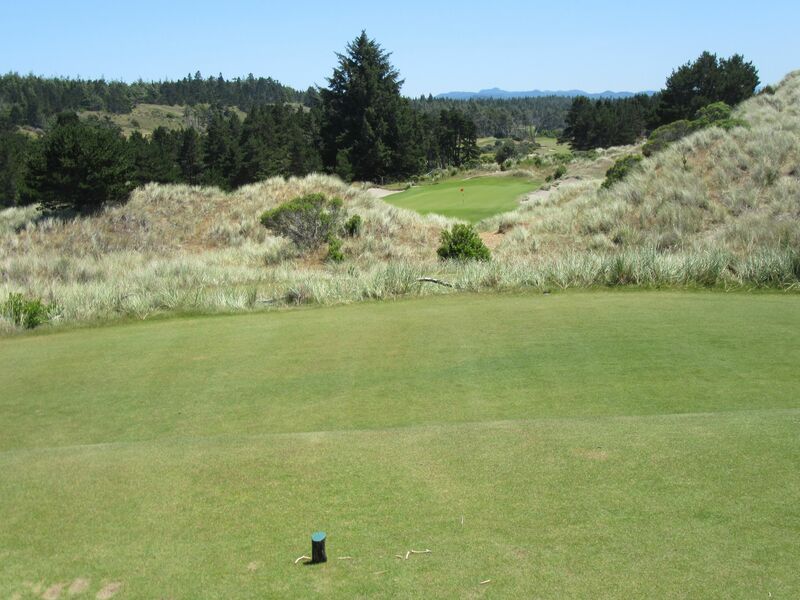 I would love to hear from you about Bandon Trails, and about the four courses at Bandon Dunes Golf Resort, in general. How do you rank the four? What are your opinions? Great write-up. 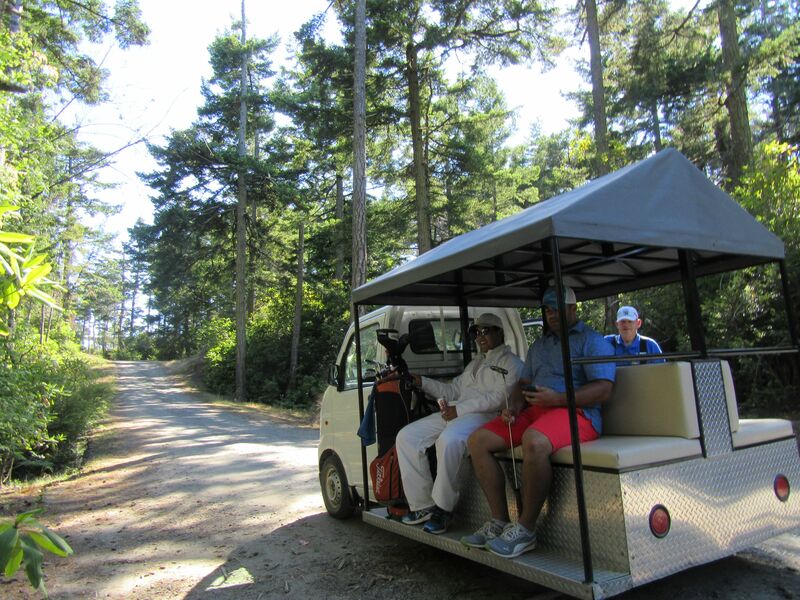 From a pure golf standpoint, Trails was my favourite course on the property. 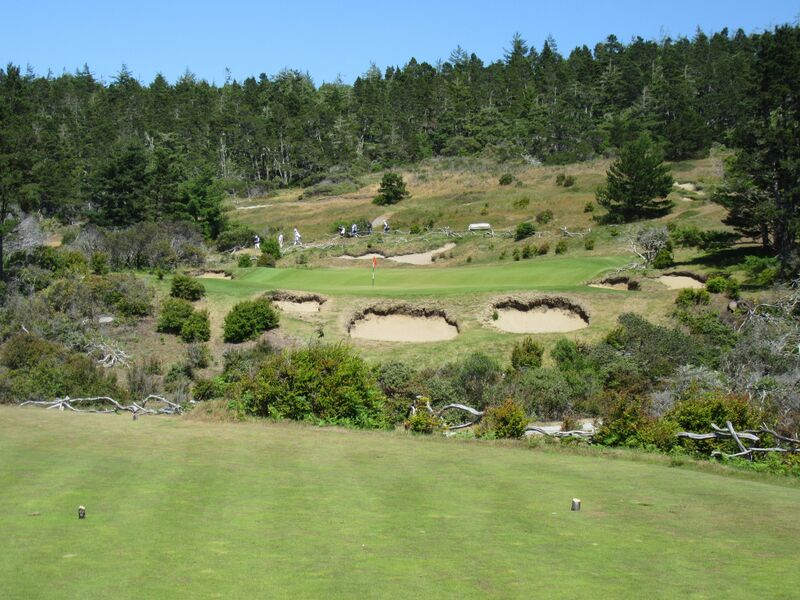 Bandon Trails was an extremely fun course to play, and even though it doesn’t have the coastal holes it still might be the most aesthetically pleasing course on the property. 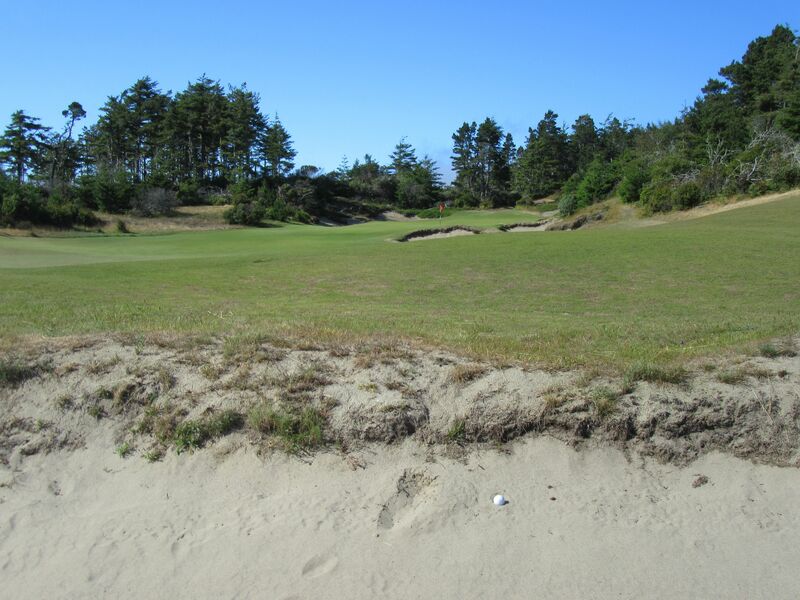 My favorite, though, I think was Pacific Dunes. 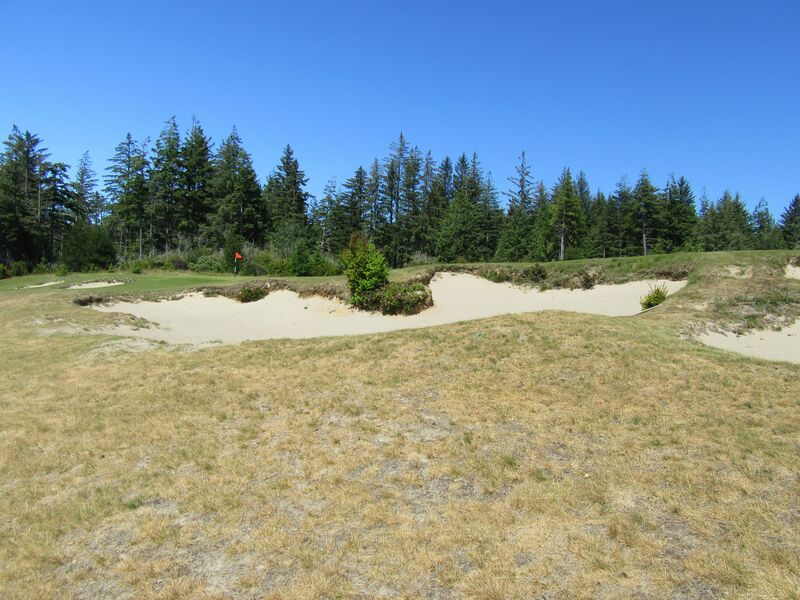 Pac Dunes just looked and felt to me like what I imagine Pebble Beach to be like. 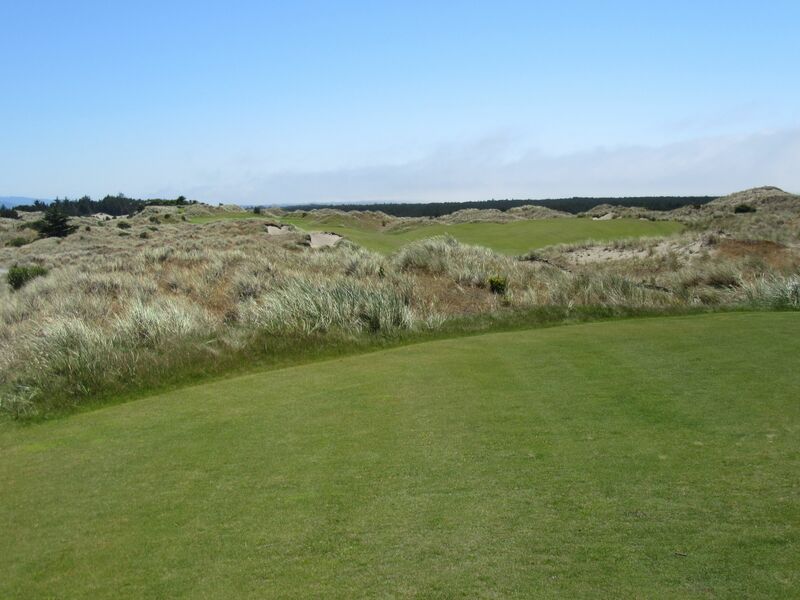 I absolutely loved all four of the championship courses, but the scale of Pac Dunes was really spectacular (which can be said about the entire resort, of course). The course I’m most excited to play again some day? Old Macdonald. Can’t wait to hopefully get out on there again. How do you rank them, Josh?